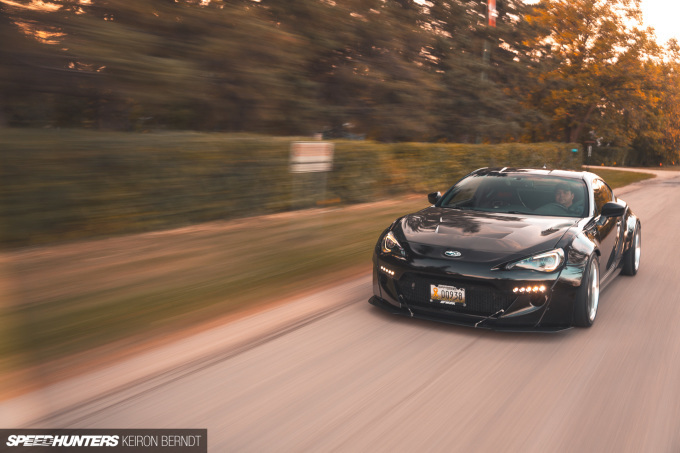 A Subaru BRZ slammed with Work wheels and a Rocket Bunny V2 kit – I can already hear cries of ‘unoriginal’ starting from deep within the peanut gallery. 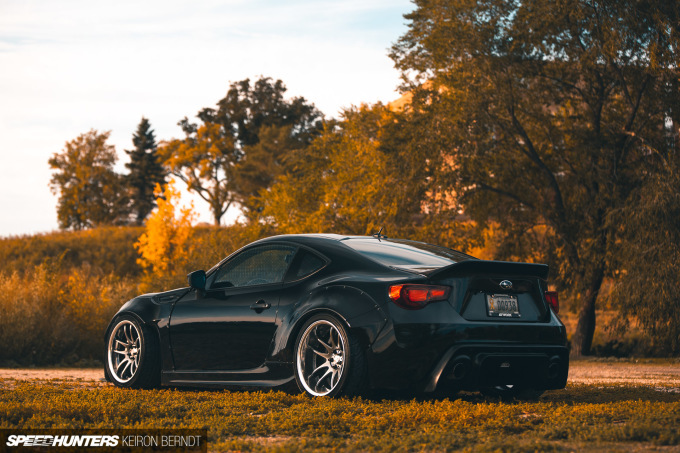 But with a car like a BRZ (or Scion FR-S/Toyota 86), originality doesn’t always need to come from the modifications chosen. 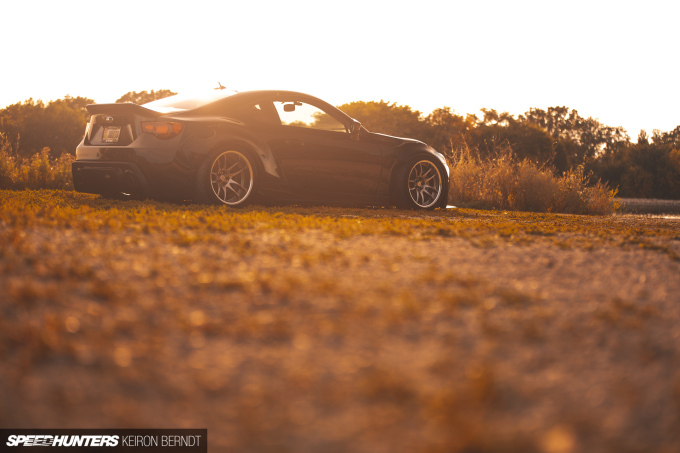 Rather it’s often how well said modifications are executed that separates a car from the pack. At this point, no matter where you live, there’s a good chance you’ve seen an ZC6 or ZN6 with haphazardly installed flares containing narrow wheels pushed out via ample spacer. To double down on trends, the car may have had a chassis-mount wing, brightly painted tow hooks, and some sort of obnoxious windshield banner loudly advertising the latest Instagram-based brand. This car is the polar opposite of that. 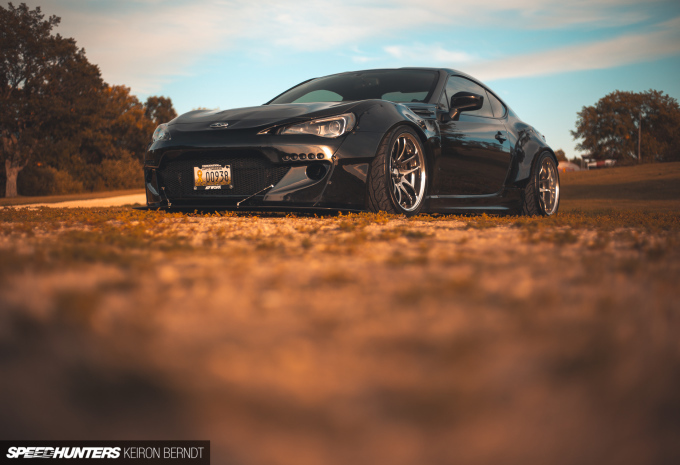 Visually understated, this BRZ has been assembled with care and precision. The type of precision that comes from someone with more than a few years in the game, and little to prove to anyone but themselves. A car guy since he was a young, but now somewhere in his mid 30s, Alex could be considered an elder statesman in a community often made up of those in their teens and early twenties. I mean no offence to Alex by that; if I owned a BRZ I’d be considered the same. Like many of us, Alex’s spark for imports was first lit in the gaming world. There, he and mates became familiar with top Japanese tuning brands by scrolling through various available modifications. In the physical world, the first car to really pique Alex’s interest in Japanese vehicles was the Z32 300ZX. Alex loves the fact that Japanese manufacturers have always strived to do more with less while utilizing the latest in available technology. In comparison to their American counterparts, he feels Japanese cars are often a precision instrument versus a heavy hammer. A love for turbos was instilled in Alex after he took a ride in his first turbo car, his brother’s Hyundai Scoupe. An oddball chassis to be sure, but one of several fun and inexpensive turbo cars from the ‘rad’ era. After selling his previous projects, a ZN6/ZC6 chassis vehicle ticked just about every box Alex wanted in a new car to build. A former Toyota employee of 10 years, Alex had followed development of the ‘Toybaru’ chassis from early concept all the way to production. Right before signing the deal on a brand new BRZ, Alex did briefly consider one other car – a used Porsche Cayman. 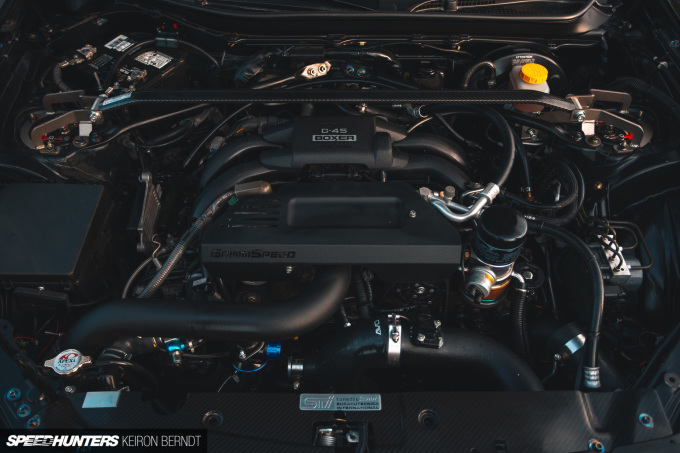 The deciding factor between the Subaru and Porsche was the engine room; after popping the hood of a Cayman he realized it wasn’t the most DIY-friendly layout. Since Alex builds his cars himself, that simply wouldn’t suffice. From delivery to initial winter storage, Alex drove his car for a brief 200 kilometres. The cold months in Canada are long, boring, and have a way of amplifying the itch to modify. Depending on how you look at things, idle hands are either good, or bad, when you have a blank canvas of a rear-wheel drive sports car in the garage. In that first winter, the car went through two sets of shock and spring combinations, a set of wheels and an exhaust, all without ever really leaving the garage. Alex was just about apply a tune to the ECU when his brother bestowed a bit of wisdom: “How about if you do something, you do it right”. So, with less than 500km on the clock, Alex dove into the engine bay, caution thrown completely to the wind. 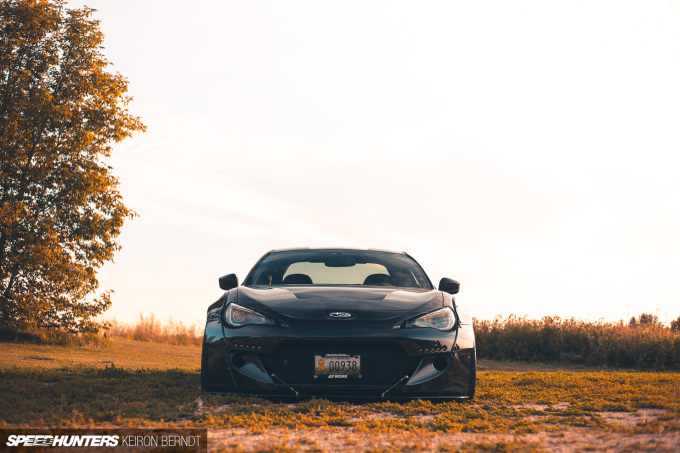 The BRZ’s moderate factory power was addressed with an AVO turbo kit, installed with an AVO 3-inch down-pipe, matching 3-inch ceramic-coated overpipe, and similar 3-inch front pipe. 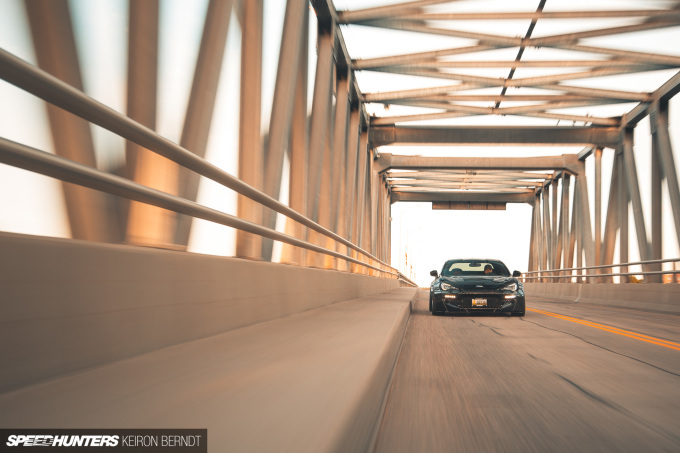 Running to the rear of the car is a Perrin cat-back exhaust system. Alex says running a 3-inch exhaust under a ZN6 is no easy task, and it actually helped dictate the suspension choice in the end, but we’ll get to that shortly. Tragedy struck a few hundred kilometers later when the engine blew shortly after a rather unexpected boost spike. There’s never a great time to lose a motor, but three days before the car was required to be shown at an event is certainly less than ideal. In the end, Alex pulled the dead FA20 on a Thursday, and had the new one in and running by Saturday. Not wanting to repeat a fairly expensive lesson, he has since installed an upgraded AVO 8psi actuator, GReddy Type FV blow-off valve and GReddy Profec II electronic boost controller. Engine 2.0 has had more staying power than the first, and is happily putting down 315whp. 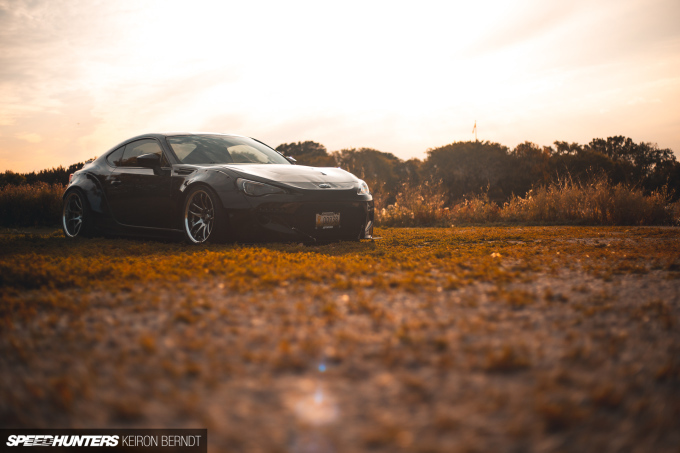 Having effectively doubled the car’s original power output, the BRZ’s factory-spec rubber could no longer keep up. We can sit here and split hairs if we must, but the Rocket Bunny V2 kit is still one of the best looking ways to put more rubber under a ZN6/ZC8. Period. 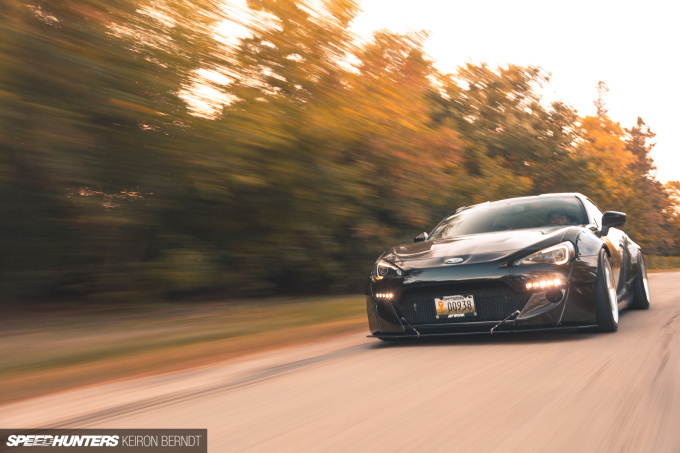 Alex was an early adopter of the V2 kit, ordering one of the first to be shipped to Canada directly from GReddy. Keen on starting that particular season off on the right foot, Alex ordered the kit with plenty of time for it to arrive and be installed before it was time to show the car. But Murphy’s Law struck and the kit ended up lost somewhere between Japan and his front door. In a bit of a lurch, with the car set to feature at another event, GReddy made right on the deal, shipping Alex a previously-landed set of flares that belonged to Formula Drift Pro driver Ken Gushi. Thinking GReddy’s Marketing Manager Mike Chung was pulling his leg, through social media Alex got in touch with Ken who confirmed they were indeed his spares. There’s probably a very short list of people who can say they’re rocking a set of FD drift spares on their street car. Within the now ample-sized fenders, Alex is running 18×9.5-inch and 18×11-inch Work Emotion CR P2 wheels over stock brakes fitted with Hawk pads and DBA T3 4000 slotted rotors. Yokohama Advan 255/35R18 and 295/30R18 AD08R tires provide a fairly square sidewall all around. 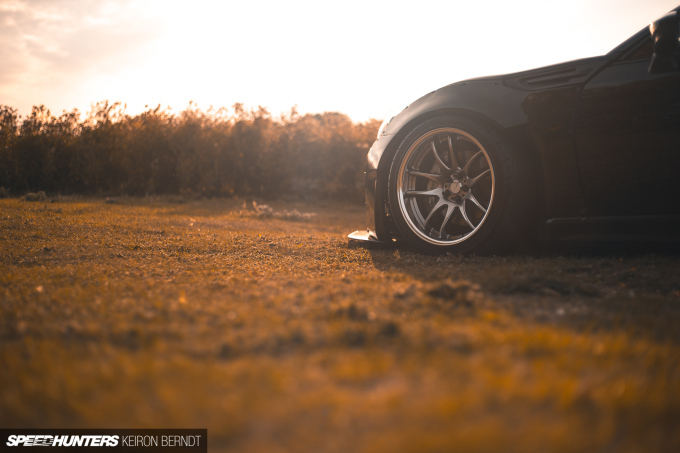 Alex opted not to run any sort of excessive camber resulting in a stance that is best described as purposeful. Remember what I said about execution? This car is on air, not uncommon among the ZN6/ZC6 community, but unless you spotted the red anodized top hats of the Air Lift Performance struts under the hood I suspect you may not have known. Alex chose air for a few reasons. The first was the exhaust issue I mentioned before; a 3-inch exhaust under a BRZ can become quite inconvenient at the most inopportune times. The second was ride comfort. In comparison to other suspension options available for this chassis, air has proven quite comfortable yet sporty. Front and rear Hotchkis sway bars, Buddy Club control arms, Perrin control arm bases, and Whiteline bushings everywhere they could be installed keep the car tight through any sort of manoeuvres. Working off his brother’s sage advice from chapter one, Alex continued to operate in full measures, versus halves when it came to interior. Starting with seating Alex, has installed Bride-made Edirb 023 red stitch seats for both the driver and passenger. Similarly, Takata Racing Drift III harnesses have been installed for each front occupant. Alex opted to get the harnesses in black over traditional Takata green to better suit the OEM black interior conversion. A Prova shift knob sits atop the shifter, and a D.A.M.D carbon fiber core steering wheel sits at the end of the column. Alex keeps an eye on his surroundings via an auto-dimming Homelink rear-view mirror and Rexpeed side mirrors. The mirrors have a bit of shake thanks to a fairly robust sound system consisting of two Alpine PDX amplifiers, six JL speakers and a Hertz 10-inch subwoofer. Alex states that while version 3.0 might be the best received build of the car yet, it’s not the last. Having received top honors at a variety of different shows, the occasional track days he’s taken the car to have given him a taste of what the car might be capable of on the circuit. 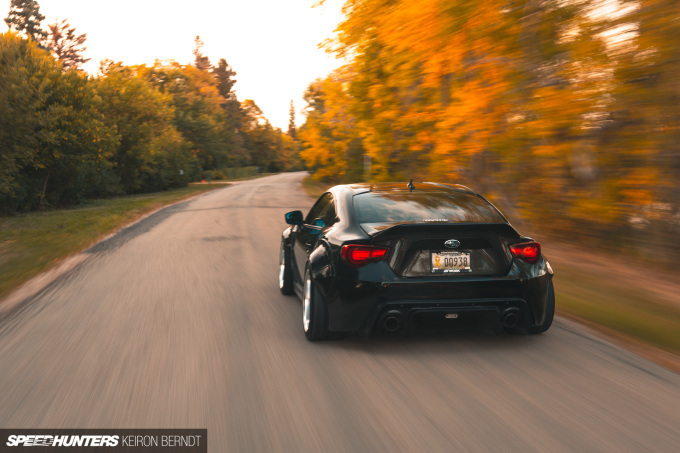 With a deep attachment to the the car at this point, and no possible way of seeing his money back if he were to sell, version 4.0 being a track car seems in line with the BRZ’s natural progression. With a blown motor in his history, I had to ask Alex how he felt about his FA20’s long-term reliability as a more track-focused vehicle. Alex acknowledges that in its current guise the engine lives in the upper limits of its reliability window. A 2JZ or LS sit atop the list of future power plants, should he tear the car down again, but for now he’s going to stick with the boxer. Again, harking back to execution, he feels he’s done everything right to allow the motor to keep on keepin’ on. As for what Alex intends to build for his next street car, he’s currently very closely monitoring the progress of Toyota’s latest cross breed – the new Supra. 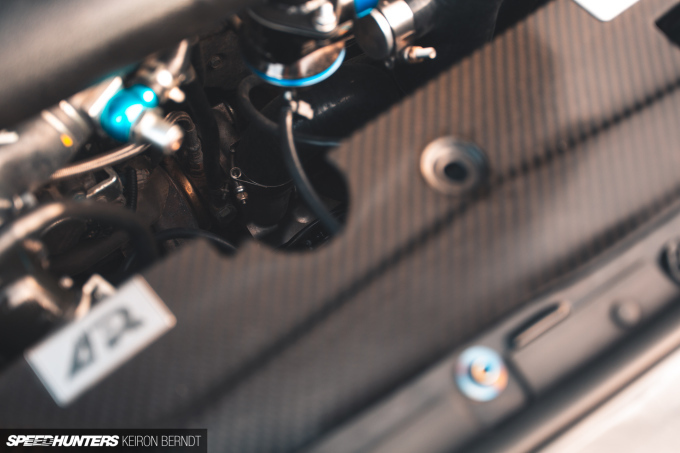 Currently employed as a BMW tech, the deciding factor of Supra or sister Z4 might just come down to what’s under the hood and how it’s presented. 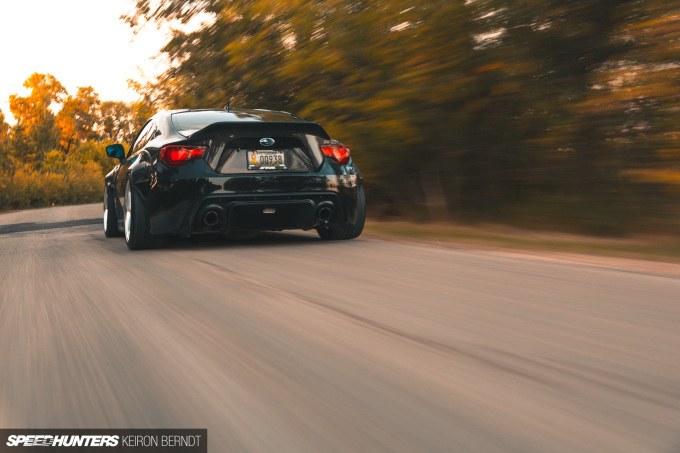 The same deciding factor that led him down the path of his BRZ.